It's time to launch my 2010 cycling climbs map. It’s time to launch my 2010 cycling climbs map. Call me stupid but I find it motivating to start each year with an empty map and try and fill it with Cols. Only rides with pretty big ascent are included. Feel free to suggest a climb. 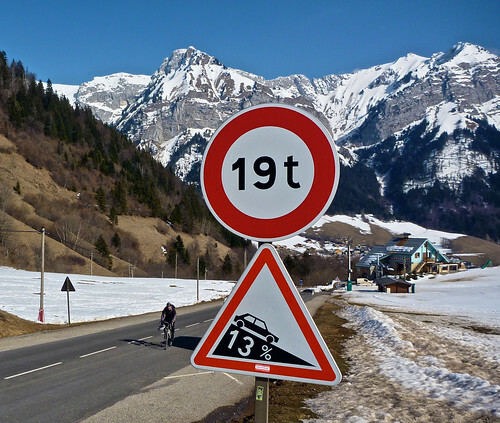 For a map of all climbs over all years – see here. For other maps see the sidebar or menu. It is necessary to use the “view larger map” option at bottom or to scroll around – to see all climbs. The map only has the climbs done so far this year ….. 😉 still early days. I do have a Dolomites map at the right with a few (not many) great Italian climbs that I have done, including Stelvio. I hope to do Gavia this year …. it looks fantastic. Tu seras le bienvenu dans le Pilat pour un 100km (sans grêle cette fois ! ;-)). I saw you had a couple of climbs near Martigny. Did you by chance get to do the Col de la Forclaz? I did it this year, around 1,500m alt. but the gradient is relentless.